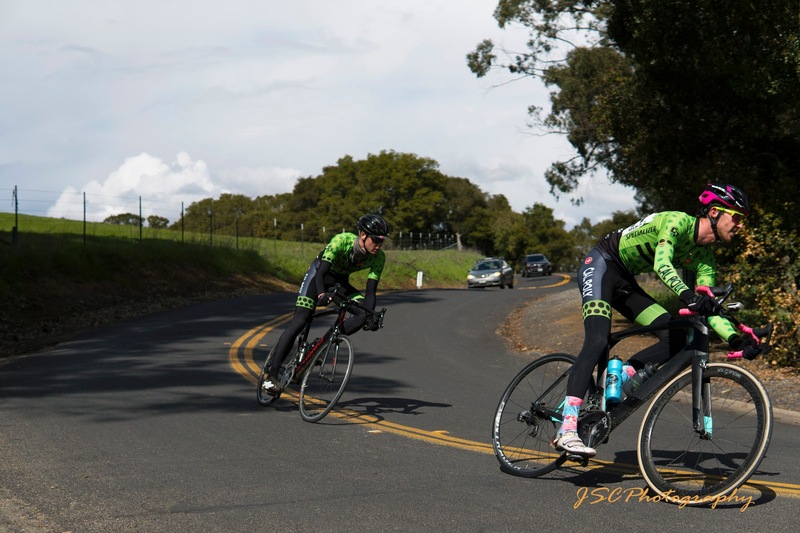 Click, clack, tick, tick, tick, swshhh, swshhh... "Five, four, three, two, one, go," exclaimed the chief referee, as we departed on a brisk jaunt around Crockett, California, for a four-man team time trial, or so we thought. Often, cycling, as a sport, is considered rather individual, avoiding the true essence of what it means to be a piece of a team. However, unlike traditional stick-and-ball sports, which require a strict set of regulations, a playing field, or court, and individuals that impact the success of a team, a sense of flow is imparted between teammates, within cycling. Considering flow, the team-time-trial event requires a great deal of precision. Similar to a relationship, communication and trust are essential. Not quite the team time trial, Colin and I cruised together during the road race. Photo: Jordan Chang. On this occasion, Saturday, March 17, in Crockett, California, marked a test for Cal Poly Cycling. Within the Collegiate Men A category at the UC Berkeley collegiate weekend, Brad Wiggs, Colin Patterson, Raymond Lee, and Sean Bird rallied, for the most part. With an early morning of racing, as with any racing, comes a certain set of challenges. Registration, hit the porta potties, create a righteous atmosphere with cranking music, pin your race numbers, kit up, apply layers, helmet, sunglasses, shoes, click, click, bang, bang, hit the porta potties, rally to the start line. Deep breath, breathe deeply, phew. Go time. Racing isn't a simple task, which is why it's necessary to have a solid group of mates in your corner. Along with Brad, Colin, and Ray, plenty of communication and trust has been garnered, through the years. Considering the amount of time that we spend together, it's amazing that some of us, well, at least one of us, have significant others. For this morning event, as we prepared ourselves, it was noticeable that time was of the essence. With registration taking ample time, the usual routine of preparation was shortened. As we hunkered down and began to focus, three dudes, lacking a fourth, rolled to the start line. With an 8:03 a.m. departure, I peered down at my clock, which read 8:02:13, prior to looking around. "Brad!" Colin yelled. Damn, we were missing Brad. Just a lone wolf, that's Brad Wiggs. Photo: Jordan Chang. At this point, the chief referee continued his morning instructions. As we looked right, then forward, before hollering in Brad's direction, seconds ticked past. Well, here we go, down one man, it was time to begin a team time trial. Although not ideal, it was understood that only three individuals needed to finish together. Our time would stop, upon the third member of our team crossing the line. "Five, four, three, two, one, go," mentioned the chief referee in an elegant manner. Tick, tick, tick, as we climbed on our gears, legs began pumping, blood was flowing, and an initial kicker of a climb was being checked off the list. As Colin, Ray, and I glanced back, Brad, a lone figure, appeared, racing up behind us. As we cruised up the first roller, waiting for our fourth and final teammate, smiles and laughs dotted the air. Together, again, here we were. With one task at hand, it was time to get on with it. Click, tick, tick went the gears. After getting up and over the top, I flicked my elbow, eased to the back, and recognized the familiar figure of the one-and-only Brad Wiggs. As I settled in behind him, no words could be mentioned. I simply smiled and laughed. "Yup, we're on, go, go, go!" I yelled, as we completed the first hairpin turn. "Nice pull, Ray," we hollered, as Ray, our fourth man peeled off. "Get up, get up, come on now, brother," Colin and I considered, as we pedaled with Brad. As this team-time-trial event reached its end, this morning had gone well. With an array of open communication and contact, we were riding well. How well? Only time would tell. "Damn, go," said Colin, as he peeled off the front, during the finishing climb. With a plethora of thoughts cruising through my mind, I glanced over to witness Colin yanking his chain into the big dog. At the same time, I shook my head at Colin's saddlebag, a hamburger, which I had been staring at for the last 20 minutes. What a guy. With the finish approaching, Brad, Colin, and I cruised in together, upping the pace and delivering a steady sprint. Pfffff, pfffff, deed done. With a quick cool-down spin of the legs, a musical atmosphere was redelivered, clothes were changed, and a sponge-bath commenced, as Ray appeared from the registration tent. "So, we won by ten seconds, yeah," said Ray, in a casual manner. With grins appearing, similar to young groms who learn to pedal for the first time, we were back to the basics, stoked to have tallied a morning victory. High-fives were slapped, cheers of joy went around, and celebratory breakfast cookies were snagged at 8:45 a.m.
Oh, as the days lengthen, the task it never easy, but it's all made that little bit sweeter with Cal Poly Cycling, a team of solid men and women. 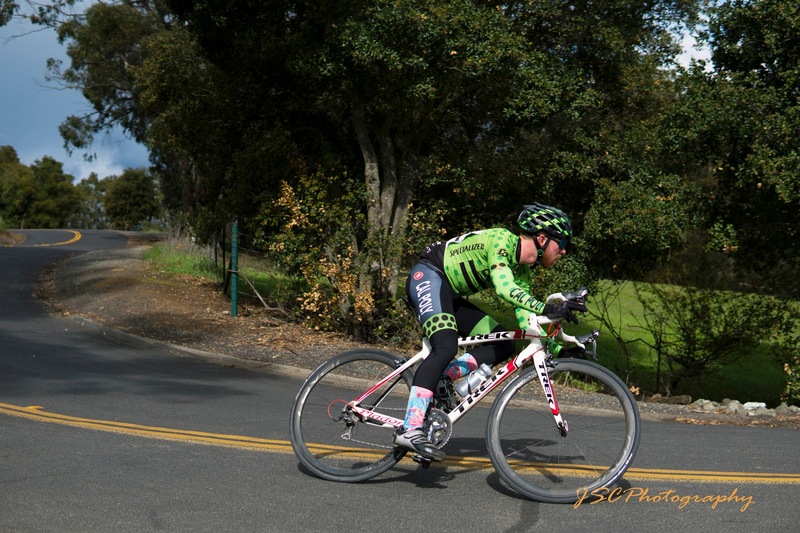 Collegiate cycling, you're doing just fine.